Model Airplane News December 1980 - RC Bookcase - Vintage Model Airplane Magazines, Catalogs. 1980 AMA NationalsAMAs big road show in Ohio by M.A.N. Staff. Midwest Products Skyhawk Field & Bench Review by Nick Ziroli. Hobby Barns Minare Field & Bench Review by Duke Hoeckele. Indoor Superstars A dynamic duo of indoor winners by Dave VTO Linstrum. The Circle Game Parti How to win in Nordic A2 competition by Gary T. Medley. MRCs Rough Rider Road & Bench Review by AI Novotnik. Gentlemen Start Your Engines Starting system for glow-powered racers by Roy Moody. 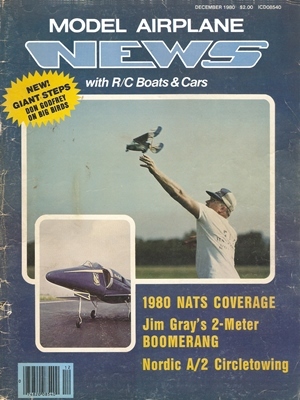 1980 Indy Unlimited Coverage on the worlds richest model boat race by Dave Lee. A Real Turkey Field & Bench Hard to believe but here it is by Al Alman. Boomerang Top-notch two-meter sailplane by Jim Gray. Blackhawk Nifty little twin-engine CL stunter by Cal Shumate and Jim Harris. Giant Steps Our newest department all about big birds. by Don Godfrey. On This Heading by Art Schroeder. Product News The latest goodies. 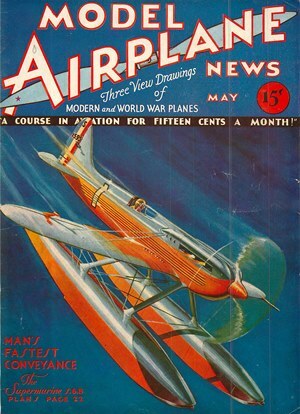 Flight Line News Pappy covers Nats pylon and other things by Pappy deBolt. Soaring at the Nats Silent doings in Ohio by Charlie Spear. Scale News Those Nats marvelous miniatures by Steve Sauger. Control Line News Action on the lines at Wilmington Ohio by Harry Higley. Free Flight News Flying Aces SAM and AMA Nats by Dave VTO Linstrum. 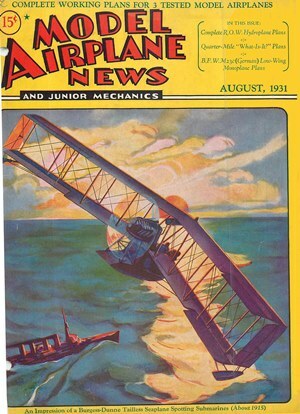 Radio Control News For the shakers in this world new items by Art Schroeder. Engine Review Round-Up Tartan 1.32 and Enya 60XF-III by Peter Chinn. Foreign News 200 mph at British Nats 4-cycle engines by Peter Chinn. For Engine Lovers Readers question our expert by George Aldrich. Hints & Kinks Neat ideas from our readers by Jim Newman. Powerboat News IMPBA Internats by John Oian. Yachting News A lot about tensionable backstays by Bob Harris. the New Year bring you health and happinessthe rest will take care of itself. seven years is evidence of Dons versatility in our hobbysport. 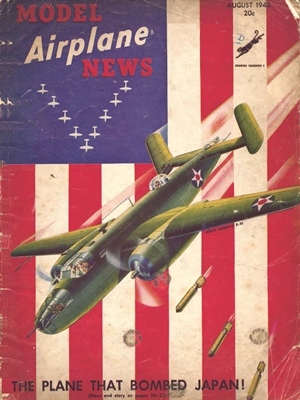 from a collection of Model Airplane News that was believed to be complete. have a preference then fire back your ballot to AMA appropriately marked. to make an informed choice. (213) 360-6213 or call Sam Brown at(805) 942-4956 to reserve your space.